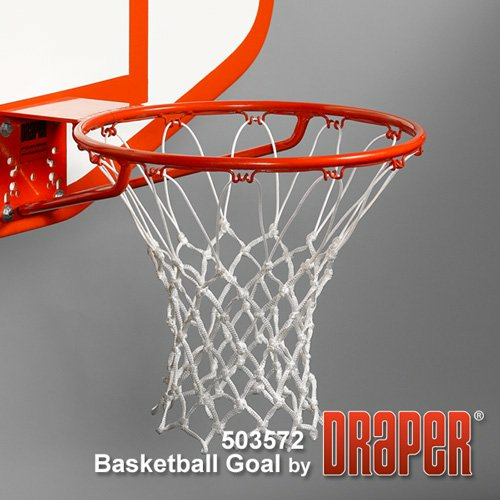 The Draper 503572 Heavy Duty Stationary Goal is the default goal for playgrounds the nation over. Looking for a low priced , quality basketball rim? Then you just found it! Heavy-duty model with a 5/8" (12mm) diameter steel support brace to withstand up to 800 lbs. (363kg) Official competition goal. Fits both 48" (123cm) and 42" (107cm) bank. Will fit most front mount backboards made of glass, fiberglass and wood. Rim is 5/8" (12mm) diameter steel with twelve "no tie" net attachment clips welded to the rim. Complete with mounting hardware and heavy-duty net. Meets all NCAA and NFHS specifications. Both for indoor or outdoor use.